It’s back! The popular Basketball trading card game will return once again in 2010/11 with all new player rankings. The game is quick and easy to learn online and the price per pack couldn’t be better – $0.99 cents! If you want to become good at the game, you need to stock up on the Extra Signature and Ultimate Signature cards. Check back in January and see if you can get some of the codes Sports Card Radio will be giving away! 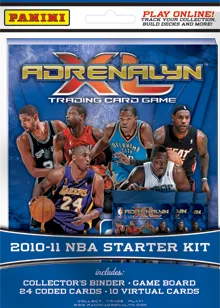 We will be once again giving away free 2010/11 Panini Adrenalyn XL Basketball Codes in 2011 and the giveaways will be – BIGGER THAN EVER – Stay tuned as Sports Card Radio gives away tons and tons of free codes during 2011. Check back in January as we back the truck up and handout the free codes by the handful!